Safely package and present your beautifully decorated larger-sized candy or caramel apple with this large disposable candy apple bubble! This plastic bubble will keep your apples fresh, protected, and professional looking for sale in your candy shop, concession stand, bakery, or gift shop! Its clear construction provides complete product visibility, showcasing the delicious toppings and colors and increasing impulse sales. Its bubble shape also provides ample room so the caramel or other candy coating doesn't stick. A functional and visually-appealing alternative to plastic bags and other containers that only make more of a mess, this apple bubble is sure to exceed your candy packaging needs. These are great for our plain caramel apples. It helps transport the Apple without the Apple getting damaged or the toppings falling off. Great quality. Product came as described. Packaging seems sturdy enough to use for shipping purposes. Great for smaller caramel apples with candy coating, but bigger apples do not fit with the additional toppings. Otherwise, great product. Very nice caramel apple containers. Holds the apple very well and keeps the caramel inside, even in heat that melted my caramel a bit! All the caramel stayed in the container thus making no mess! I love these candy apple container they have been great to display my apples. They close easy and mom problem getting them where they need to go. Great quality and awesome price! These worked perfect for my candied and caramel apples this year! And my sticker with my logo fit perfectly on it! These containers work perfect for candy apples, especially compared to plastic bags. Only issue - if you add too many toppings, the apple is too big for the container. I bought these for my caramel apples but with all the coatings they are too small. I am going to save them for candy apples and make them smaller. I think that they would be great for just regular size apples and not the big ones. The first time I bout these they worked okay as long as your caramel was fairly hard, I make my caramel apples slightly soft so they had to be covered in candy to work with these. I will be definitely purchasing more of these containers. They display my products so beautifully and I love that they are free standing. Many of them did not remain closed as they should, but overall a descent product. These are great for apples dipped in caramel and dipped in one layer of chocolate. I did find that you can not dip in more than 2 layers because the apple will not fit. Perfect size for larger candy apples easy to use, though some were a little tough to close i was still able to use them! Will reorder and Price was great! Perfect size and support for large apple that can be decorated. I use them always. 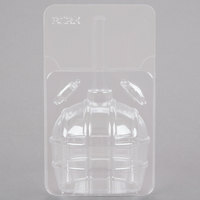 Keeps apples fresh undamaged and the clear bubble allows you to see the designs. An affordable way to package our caramel apples and big enough for our gourmet apples that are loaded with extra toppings. I can easily place a label on the front and it looks great. These are really good containers for apples. They snapped pretty ok, a few needed staples. They sit on a slant, but I think that displays the product well. I’ll buy again. Also, used as a backup cupcake container! Hey guys, I ordered this item for taffy and candy apples and was very please with with what came. Mine stayed closed no issues with that so I’m happy ?? These apple bubbles are large and perfect for holding any size apple. They’re very sturdy and easy to assemble. I’d prefer using these than bagging and tying. They’re definitely a time saver. These Candy Apple Bubble packs were great for our candy apples and Carmel apples. The kids at our church loved them. The packing was the perfect touch to at that special something. Good containers. Nice for the price. I purchased these for caramel apples and old fashioned candy apples. Very sturdy and compact. Only drawback for me is the snaps. They are cumbersome and seems as if they might break. Recently added several varieties of Caramel Apples to our menu. Customers love the product and packaging. Bubble pack holds the product perfectly. Quality product will purchase again! Pretty disappointed in these. I guess you get what you pay for? :-/ Only Every 3rd or 4th bubble so far has actually snapped shut on its own. I had to move my label down over the separation so that the bubbles would not come open, thus exposing the top of the stick so air can get down inside. Also it doesn't look as nice. Pretty bummed about that. Thank you for your review! We are sorry this Large Disposable Candy Apple Bubble has not worked well for you. A Customer Solutions Representative will contact you soon! These are just what I needed to present my candied apples. I will definitely order again and recommend this site to all of my friends. I love these! They keep the moisture out of my candied apples and they look as pretty as they did as they left me onto the customers processions! I highly recommend these! This packaging is great as plain caramel apples did not stick to container much, when Carnival King caramel dip was used. Even thought it states large, gourmet apples with nuts and chocolate wouldnt fit, unless apple was small itself and well rounded. It was perfect for my caramel and chocolate apples. It closes very good. I can transport them without a problem. And the price was the best in the market. I was recommended to try these containers and feel in love with them..i will be ordering more. They made my candy apples look really great. They are sturdy and made the display look prpfessional. Thanks a bunch. These are perfect for my Caramel Apples. They are very sturdy and snap closed so they are great for transporting items as well as displaying them. Amazingly satisfied! I'm very amazed and happy to have purchased this item. Fits a variety of apple sizes. The Apple Bubble Covers helped make these delicious chamoy apples look clean and professional. In love with them and will definitely be coming back for more! We were really excited to try out a new container for our caramel apples on a stick, but were slightly disappointed with these. We have to staple them shut as the little closure spot isn't the greatest and it doesn't fit large apples, so it took us extra time finding the right size apple for the container. These candy apple containers are simply the best. I'm so Happy that I found them and I will surely be ordering more from this company!! We made lots of candy apples and they were such a great hit with the kids. We chose smaller apples because of the kids and there's a bit of space in the bag but there are still great because they lock securely and they keep the apples fresh. We love them. What a great price for these! If you're having a Halloween party, try doing a build your own caramel apple station with these- it's always such a favorite! I'm glad I was able to find these they were great package for the caramel apples we were able to sell at the festival easy to seal them! Will buy them again! Highly recommend if you are attending a festival or are looking for a way to present your caramel or even hard candy apples in a professional way. Packaging adds a nice finish to your product and allows for a full 360 view of your dipped apples. Love it! Large Disposable Candy Apple Bubble - 750/Case very easy to use,very nice quality. Great price on shipping these will not break the bank. Just buy them. These work perfect for my chocolate covered apples! Easy to carry and package and you can see the designs all around. Makes the finished product look very professional. These candy apple bubbles are awesome. we were using plastic apple bags..what a mess. No more with these containers. Super easy to load the apples and just as easy for the customers to get to their treat! Absolutely LOVE these! The problem of how to cover your caramel/candied apples can be solved with these at a great price! Perfect for carnivals or children's party! They are sturdy and keep closed during transport. These were awesome. I used very large green granny apples and they all fit as long as the bottom of Apple did not spread as much. I love these containers! The apple and stick have plenty of room inside without being squished! There is even enough room to put toppings, like nuts or candy, on the apples. A few didnt want to stay closed, so we stapled the top- easy! These caramel apple bubble trays were perfect for the caramel apple fundraiser that our company partook in this year. We loved them so much that we will be using them exclusively for all of our caramel & candy apples. These containers are so clear! This is a great product for an affordable price. Its restaurant quality! I will definitely be ordering again soon for my bakery. The customers love it! The apples look great in here and travel well. These Bubble disposable containers were a big hit for our football fundraiser. The made the process for storing and transporting the apples so easy. Plus, it gives a nice appearance for each candy/caramel apple! It is also a very good deal, as you get 50 in a pack! We cant wait to make more this year! The product is great, the shipping cost is not! The containers are easy to use and make the attractiveness of the candy apples really stand out. The product and service were both phenomenal! This was great packaging for a medium sized caramel covered apple! It looks very sleek and professional! I would recommend this product to anyone!